Lots of fun finds are stacking up in my workroom lately, so today I experimented with two quick projects. 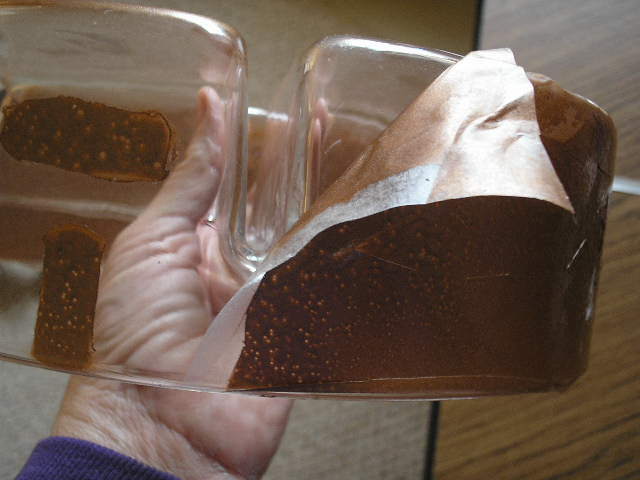 I had a clear glass serving piece bought for $3.99 at DISCOVERY THRIFT in Milaca, MN and a $0.25 metal TV tray from Hand-To-Hand Thrift in Pease, MN. 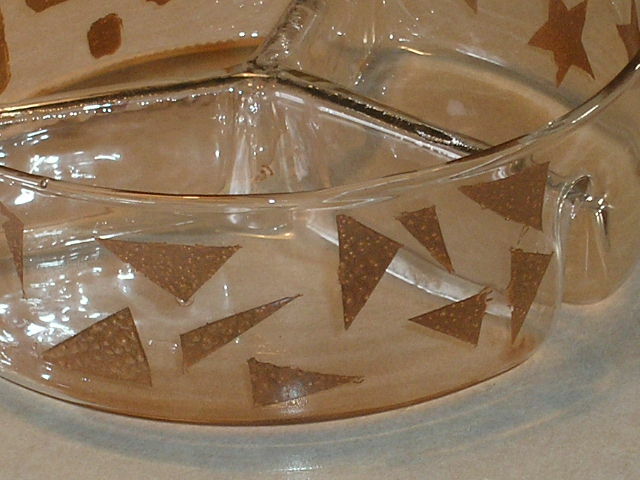 The glass piece is divided into three sections and I knew I wanted to use it for a candy dish. I’ve had an idea for the tray for quite some time. 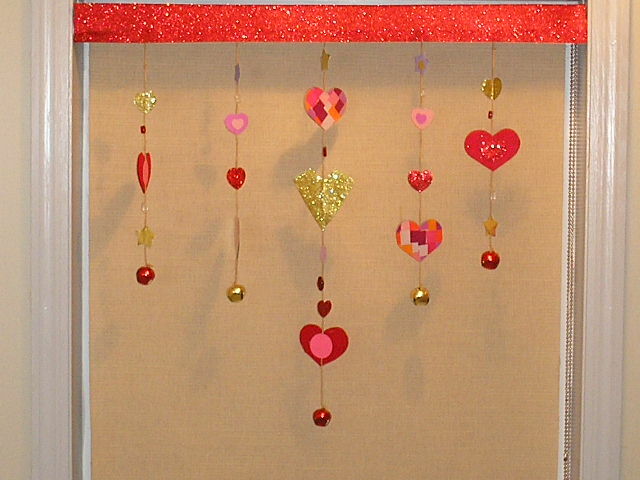 It will be a chalk and magnetic message board. 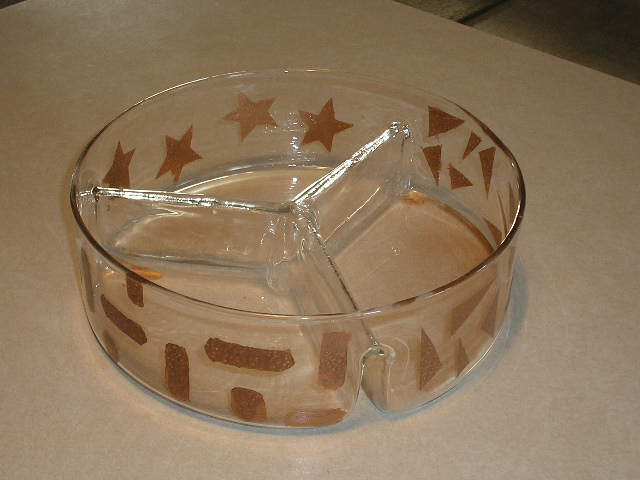 Below is the finished candy dish. 1. 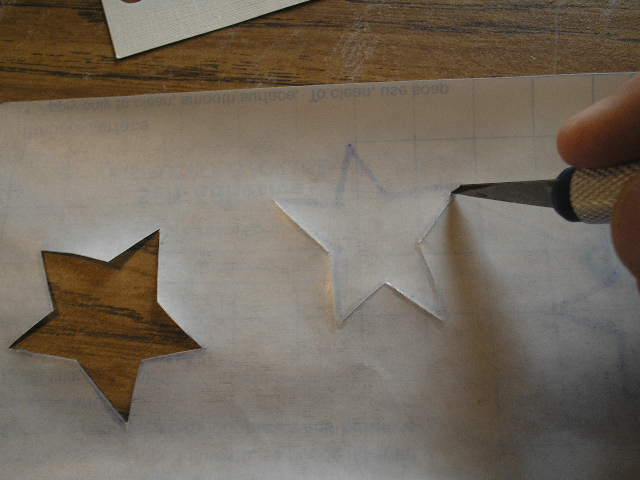 I cut seperate pieces of contact paper, measured to cover the areas I will paint. 2. On the paper backing of my contact paper, I drew out shapes and designs that I wanted to show on the glass piece. 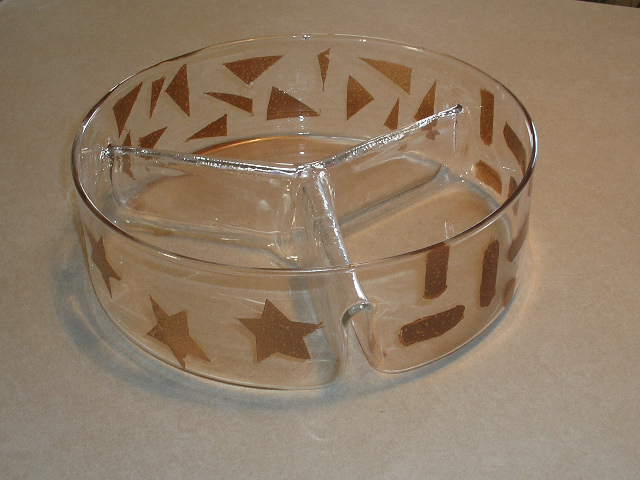 My container has 3 individual sides; I drew stars, assorted triangle shapes and rectangles with roughly rounded corners. 3. Still working from the paper side, I then used an exacto to cut and remove the individual shapes. 4. 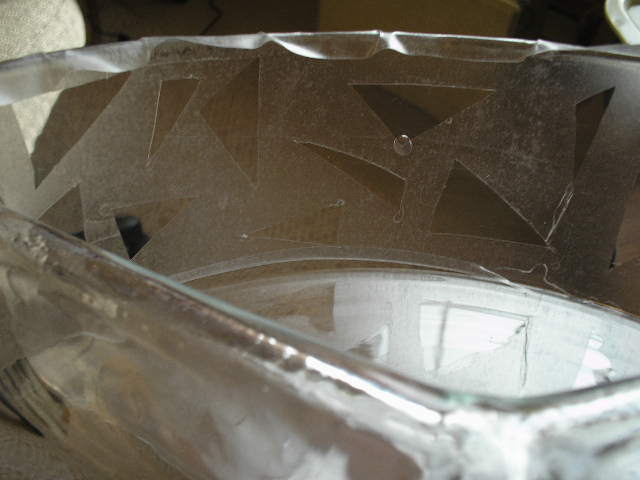 Next, I carefully removed the backing paper from the contact front, and slowly adhered it to the outside of my bowl. 5. Go slowly and smooth out any bubbles or wrinkles in your contact paper, as best you can. 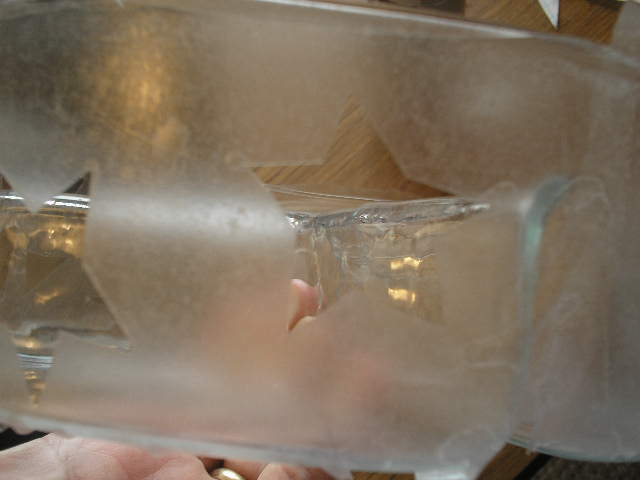 It’s important to have all edges around your open shapes, as tight and smooth to the glass as possible. 6. Prepare your spraying area. I worked in the garage, with a window open and a ceiling fan on. The garage is heated so warm enough for painting. 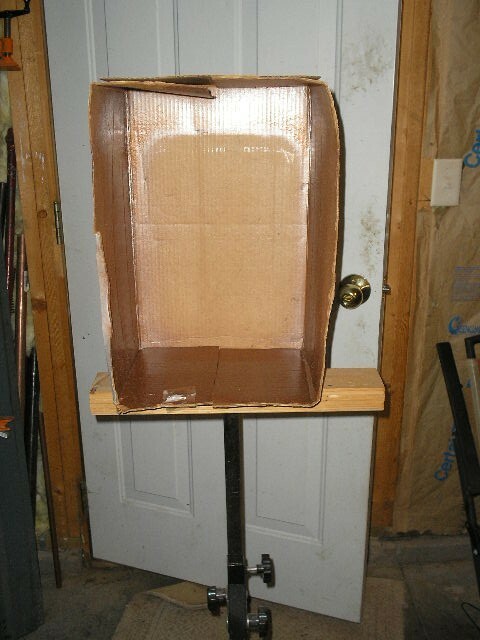 I secured a roomy box to a saw horse, then pulled it out into the room, where nothing would be hit by overspray. Here, you can see an outline of the TV tray I also worked on today, against the back of the box. Shake your spray can vigorously for a minute or so, and begin. Wearing your mask and gloves, hold the piece in one hand and begin to spray the sides. When spray painting, do light, quick sprays from side to side. Spray … go just beyond your target, then release. Again, side to side, spray quickly and release. Don’t hold down the nozzle for a long time and continue to spray, you’ll start getting clumps and drips in your paint. The paint I’m using today is Rustoleum Hammered Copper. If you notice what may seem to be bumps in the paint on my finished project, it is just part of this paint’s effect, to resemble the hammering. Ideally, I probably should have used just a regular color or metallic, but this is what I had available and in the color I wanted. 7. When finished painting, carefully place your vase on newspapers, and allow it to dry thoroughly. 8. 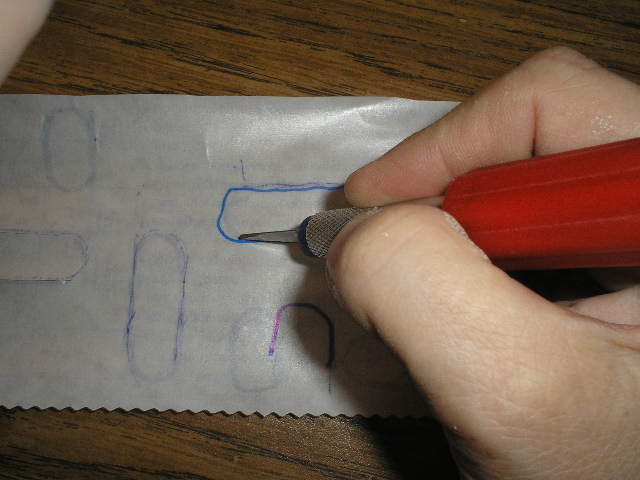 When it is dry, carefully peal off the contact paper and reveal your design. TIP: It is nearly impossible to avoid overspray in the other areas of your piece. This has a bit on the bottom of the bowl, and some inside. I’m not too concerned about the overspray. My bowl is primarily for decoration and will hold wrapped candies. But I will probably attempt to use a touch of acetone on a cloth and wipe it out later. That should do it. And make sure if you are serving food in your bowl, that all the excess paint is removed from the inside, to avoid any contamination. Then carefully hand wash your bowl with sudsy water, before using. TIP: ALWAYS HANDWASH your painted piece. Try not to use excess water on the painted surfaces; just a dampened cloth. I’ll post the TV tray project tomorrow. This original article “Fun Finds Project” appeared first on Artzzle.com.